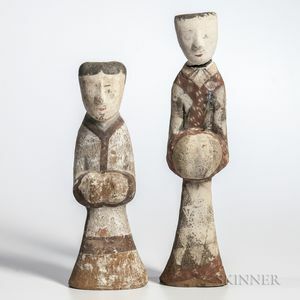 Two Painted Pottery Figures, China, possibly Han dynasty, both standing with their hands together under their sleeves, ht. to 15 in. Provenance: Lot includes letters to certify that the figures were excavated from Henen Province, Xian, issued in 2002 by Po Yuen Tong, Hong Kong. one with broken head, losses of painted details.